Keep your knuckle dusters handy! Put all that money you're going to need for the zombie apocalypse in this awesome wallet! Inspired by the season two episode of the same name, The Walking Dead Cherokee Rose Ladies Wallet is perfect for The Walking Dead lover in your life! 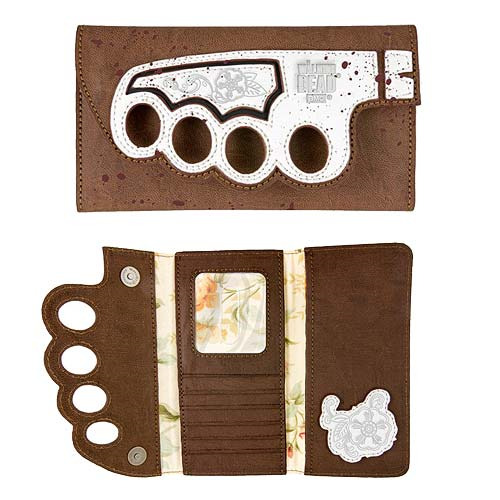 This wallet features a die cut feature to look like the handle of Carol's brass knuckle knife on the outside and pops of vintage-style floral lining on the interior! Wallet measures 4 1/4-inches tall x 2 3/4-inches wide. Ages 14 & up.